All four candidates vying for an MLA seat in the upcoming provincial election for the Taber/Warner riding took time out of their busy campaigning schedules to speak at a student forum on Friday that saw a packed house at Central School gymnasium with approximately 350 students. 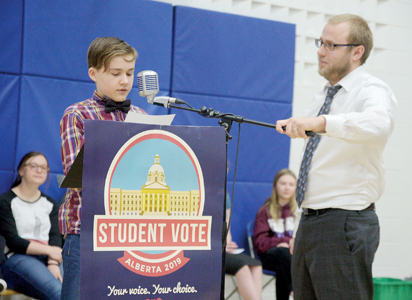 The Alberta Party, NDP, United Conservative Party and Liberal all answered six prepared questions by students, while also outlying their platforms to the youth as part of the federal Student Vote Initiative which W.R. Myers School helped spearhead alongside Taber Mennonite School. Each question also featured a five-minute general discussion period past each candidate’s answer to the question. The first question out of the student gallery keyed on the downturn of the economy, asking where candidates stood on wage issues and employment if their party were elected. Amy Yates, Liberal candidate for Taber/Warner echoed Giroux’s sentiment in not wanting to roll back minimum wage for youth. Jason Beekman, Alberta Party candidate noted he has seen a lot of jobs lost due to the minimum wage increase, but chose to focus more on government red tape and taxation that has stalled the economy. UCP candidate Grant Hunter was last in line to answer the question and brought up a story of his daughter who works at A&W. She was happy to see the $15 minimum wage until the business cut her hours back two-thirds. There was some disagreement among candidates on whether or not minimum wage should be a living wage, with Hunter arguing it should be a ‘training’ wage during discussion period. While Beekman agreed minimum wage should be seen as a stepping stone of bigger/better jobs, he countered it is naive to assume those bigger better jobs are plentiful for people to transition to. Another student came to the podium voicing environmental concerns with climate change, and the carbon tax being a potential way to change people’s spending habits on products that produce carbon. She asked the parties what their plans were to address climate change if their party was elected. “We see it (climate change) in our more extreme winters and our extreme, drier summers. What the Alberta Liberal government would like to see is more transparency in what the carbon tax is going for. With this, we’ve seen solar panels for public schools, we’ve seen buildings that have desperately needed to be upgraded, we just want to make it more transparent,” said Liberal-candidate Yates. Alberta Party candidate Jason Beekman stated the argument of whether climate change is real has to end, being it is real and steps need to be taken to ensure clean air and water. He tipped his hat to the NDP in making inroads to that end, having seen significant reductions in emissions since the carbon tax was introduced. But, he found problems in the carbon tax in that it is a flat tax and it shouldn’t work that way. United Conservative’s Grant Hunter acknowledged climate change is real but added the NDP’s path to address it is a poor one. “They have put a $1.4 billion tax burden on Albertans. This is the largest tax hike Albertans have ever seen in their history. It’s affecting senior citizens on fixed incomes, it’s affecting schools. This is not the right approach,” said Hunter. “I’ll straight out tell you we are going to repeal the carbon tax. That will be our first bill,” Hunter added to rousing applause. NDP’s Laura Ross-Giroux admitted no likes a tax. But, she added the tax has remained in Alberta to be invested. She furthered if Alberta had not brought in its own plan for climate change with the carbon tax, the province would have had a carbon tax imposed on it from the federal government. “Who knows where that money would have gone. We are making great strides in reducing our carbon footprint. We’ve reduced carbon emissions by seven megatonnes, that’s one third of the total output by Manitoba right now. The money that is taken is spent right here in Alberta, we know where it’s going,” said Giroux, adding 63 per cent of households are getting a rebate. In general discussion period, Hunter added Canada produces 1.6 per cent of GSG emissions in the world. Hunter divided that number down to less than one percent for Alberta’s emission given its overall population to the country. Beekman added he has a problem with rebates which the NDP and Liberals were noting because it’s not money that is the government’s in the first place. A carbon tax should be incentivized to the big polluters. Given it was a student forum, education funds were on the minds of kids in another one of its questions, and also class sizes and educational assistants for students whose first language is not English. The candidates were quizzed on how they would help make education stronger and better. UCP’s Grant Hunter held up his party’s 117-page platform, highlighting two parts of society, the heart and the head. The heart is health care, education and other wrap around services which make a society run. Giroux highlighted the NDP’s record on education, noting 4,000 teachers being hired to deal with class sizes, with an estimated 15,000 new students coming in next year. “Under the Notley government, we have frozen tuition rates for secondary-schooling. We are looking into doing more technical schooling. We want to make sure you can stay in school as long as you can to get the skills you need to enter the workforce the best way you possibly can,” said Giroux. Liberal’s Yates agreed class sizes need to be lessened with more assistants so no student is left behind. “We are looking at more training to get into the workforce at the high school level,” said Yates. Beekman was last to speak on the education question from the student gallery, adding it is the top priority of the Alberta Party platform. They want to keep the curriculum review going forward. The student forum also asked questions on health care and pipelines.